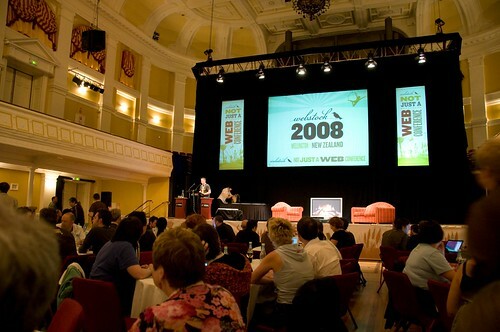 Webstock takes place at the Wellington Town Hall. 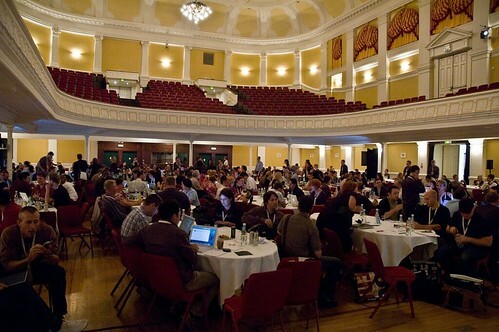 It’s a lovely, ornate venue, redolent of an age of soaring ceilings and stunning plasterwork. It’s a venue that lends itself to a sense of occasion. As you can see, we sit people around oval tables, rather than in rows of lecture style seating. This came about by accident in a sense. 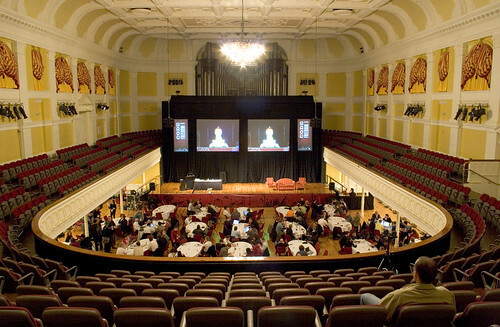 Prior to the first Webstock we were looking at the venue and it happened to be set up for a dinner, with oval tables set about the auditorium. It just looked right, and we made a decision to do things that way at the conference. What it means is that instead of sitting in a row, where you can maybe talk to people on your left and right, you’ll find yourself sitting around a table with 10 other people. Complete with room for your laptop, power outlets for everyone and ubiquitous wi-fi. (Yes, we’re assured this will be rock-solid for the conference!). We think it makes for a more social conference. Of course it also means that we can’t fit as many people into the auditorium as with lecture style seating. There’s a limit to how many we can seat at the tables and we reached that last year, having to close registrations a week out from the conference start. We’re nearing that limit this year again, so we’ve decided to open up the mezzanine floor of the auditorium. Here’s a couple of photos showing how this looks. The mezzanine floor offers a great view down to the main stage and we think will appeal to a number of people throughout the conference. It will also allow us to have a few less tables downstairs in the main auditorium, meaning the back tables won’t be quite as far back as previous years. Bottom line: We’ve got slightly increased overall capacity over previous years. There’s more choice on where to sit. We’re filling up the available space quickly. Don’t wait too long to register!